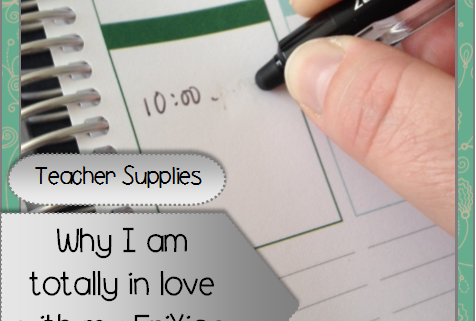 Like most teachers, I love SCHOOL SUPPLIES! Organization is also something I love, and this year I made the decision to buy an Erin Condren Life Planner to help me keep my sanity! Learn how I did it without breaking the bank! After purchasing my EC Life Planner, I discovered a huge EC following on the internet! You can get lost in the variety of YouTube EC “unveilings” and “Plan With Me” videos available – and learn handy tips for how to customize your planners (not JUST EC Planners, but ANY planner!). 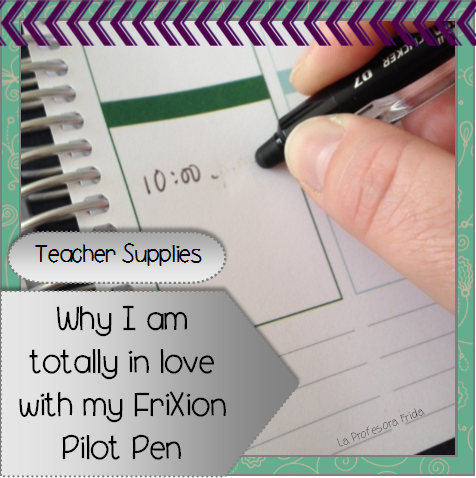 One of the BEST TIPS I found for organizing my planner was to try out the Pilot Frixion Erasable Pen! I prefer to use a pen in my planner/agenda, because I think it looks nicer. Before the Frixion pen, I just used a regular pen. And any time plans changed, I would have to use a sticker or white out to cover up the words so I could make the change. Which just didn’t look nice. The Frixion pen was a great solution to this problem! Take a look at how well the ink erases so you can write something new! Fantastic! The Frixion pen comes in a variety of colors which also helps you customize your agenda / planner. I just found out they have ERASABLE MARKERS too! What?? That’s next on my list! American Teacher in Spain. Spanish teacher and curriculum writer. World traveler. Avid reader. Artist. Lifelong learner.